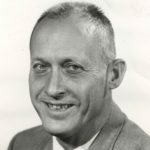 Bill Bowerman was an American track and field coach and co-founder of Nike, Inc. Over his career, he trained 31 Olympic athletes, 51 All-Americans, 12 American record-holders, 22 NCAA champions and 16 sub-4 minute milers. During his 24 years as coach at the University of Oregon, the Ducks track and field team had a winning season every season but one, attained 4 NCAA titles, and finished in the top 10 in the nation 16 times. As co-founder of Nike, he invented some of their top brands, including the Cortez and Waffle Racer, and assisted in the company moving from being a distributor of other shoe brands to one creating their own shoes in house. "A teacher is never too smart to learn from his pupils. But while runners differ, basic principles never change. So it’s a matter of fitting your current practices to fit the event and the individual. See, what’s good for you might not be worth a darn for the next guy."